Wide receiver continues to be a treasure trove of talent and fantasy points. For those owners who invested in Stefon Diggs a couple of weeks ago, the big games keep rolling in. While there may not be another receiver on the waiver wire with that kind of upside, there are still points to be found. Let’s look back at the results from last week and then get into my recommendations heading into week 9. Amendola appears to be more of a matchup play as Brady still favors Gronk and Edelman. Adams should produce, Green Bay was completely dominated by a ridiculous Denver defense last week. Washington is on the cusp of must-start territory, but Hopkins keeps him a WR2 or WR3. Jackson should be returning, so if he is somehow still available you should obviously pick him up. Harris has quietly become a relatively dependable option and one of Eli Manning’s secondary targets. Harris is a big play waiting to happen and also contributes in the return game. While he is likely to remain a flex play, Eli will take some shots to Harris and he can definitely help out fantasy teams. Just don’t expect him to score multiple touchdowns again in the coming weeks. That Giants versus Saints matchup was an anomaly that is unlikely to be repeated anytime soon. Steve Smith Sr. is done for the season and the Ravens do not have many other playmakers on the roster. Aiken has acted as the second wide receiver on the team, but now he will have to step up and try to be the number one option. There is a good chance that he will not be up to this challenge and it could actually hurt his stats seeing the top cornerback of every opposing team. The opportunities that he will be afforded cannot be ignored though. Even if his scoring comes in garbage time, Aiken should see enough passes thrown his way to pile up some fantasy points. Austin can go off any week, he needs to be on a team. The Rams are suddenly looking like a team with a lot of options on offense, or at least a couple of options. Todd Gurley is opening up the St. Louis offense by gashing opposing defenses on a weekly basis. 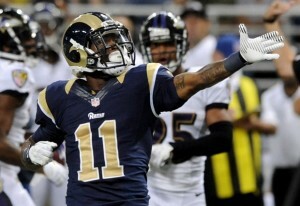 One of the beneficiaries of defenses keying on the running back is the diminutive-but-explosive Tavon Austin. His production has been fairly consistent this season, but he occasionally will rip off a 15 or 20 point game. For teams that are thin at wide receiver, it may be worth gambling on Austin going off. I recommended Washington last week and I see that his ownership is still fairly low. The Texans are going to be throwing a ton for the rest of the year and Hopkins cannot catch every pass. The majority of balls thrown to other people will be targeting Washington, making him a valuable commodity. If he is out there in your league, scoop him up this week.